کریمایی, حدیثه, قربانی, رامین, حسینعلی پور, سید مصطفی. (1397). پیاده سازی نظریه ناپایداری هیدرودینامیکی خطی بر روی لایه سیال مخروطی توخالی خروجی از یک انژکتور جریان چرخشی. علوم و فناوری فضایی, 11(4), 1-10. حدیثه کریمایی; رامین قربانی; سید مصطفی حسینعلی پور. "پیاده سازی نظریه ناپایداری هیدرودینامیکی خطی بر روی لایه سیال مخروطی توخالی خروجی از یک انژکتور جریان چرخشی". 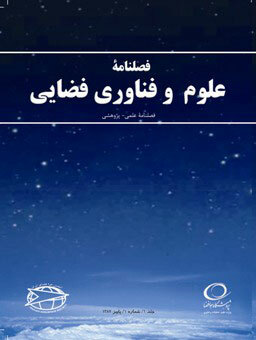 علوم و فناوری فضایی, 11, 4, 1397, 1-10. کریمایی, حدیثه, قربانی, رامین, حسینعلی پور, سید مصطفی. (1397). 'پیاده سازی نظریه ناپایداری هیدرودینامیکی خطی بر روی لایه سیال مخروطی توخالی خروجی از یک انژکتور جریان چرخشی', علوم و فناوری فضایی, 11(4), pp. 1-10. کریمایی, حدیثه, قربانی, رامین, حسینعلی پور, سید مصطفی. پیاده سازی نظریه ناپایداری هیدرودینامیکی خطی بر روی لایه سیال مخروطی توخالی خروجی از یک انژکتور جریان چرخشی. علوم و فناوری فضایی, 1397; 11(4): 1-10. پدیده ناپایداری و تجزیه جت‌های سیال به خاطر کاربرد فراوانی که این جت‌ها در صنعت دارند، همواره مورد توجه بسیاری از محققین بوده است. یکی از موضوعاتی که بسیار مورد توجه قرارگرفته است، بحث دینامیک تشکیل قطرات و عوامل تأثیرگذار بر آن است. در فرآیند اتمیزاسیون، اختلال­های کوچک در جت یا لایه مایع رشد می‌کنند و در نهایت موجب تجزیه آن به لیگامنت­ها و قطرات ریزتر می­شوند. به فرآیند شکست ابتدایی جت سیال، شکست اولیه گفته می‌شود. مرحله شکست اولیه در فرآیند اتمیزاسیون با توجه به حرکت امواج روی سطح لایه سیال، به کمک تحلیل­های ناپایداری، معین و قابل تعیین است. نظریه ناپایداری تا کنون در تحقیقات پیشین به صورت خطی و غیرخطی ضعیف بر روی لایه استوانه­ای شکل سیال پیاده­سازی شده است و اثر مخروطی بودن لایه در مدل لحاظ نشده است. بنابراین به منظور اصلاح این مدل، در این مقاله تلاش شد تا تئوری ناپایداری خطی بر روی لایه مایع مخروطی شکل پیاده­سازی گردد و بدین ترتیب علاوه بر سرعت‎های محوری و محیطی، سرعت‎های شعاعی فاز مایع و گاز نیز به معادلات حاکم اضافه گردد. از نتایج این مدل اصلاح شده شامل مشخصه ­های ناپایدارترین موج سطح لایه سیال (عدد موج و نرخ رشد بیشینه)، برای تخمین قطر میانگین قطرات و همچنین طول شکست می‎توان استفاده نمود. پیش بینی این مدل اصلاح شده، همخوانی خوبی با نتایج تجربی موجود دارد. In the atomization process, small disturbances grow in liquid jet or sheet and eventually cause to disintegrate it into ligaments and smaller droplets. Concerning to the motion of waves on the liquid sheet surface, the stage of primary breakup is deterministic and can be predicted by instability analyzes. In early studies, the theories of linear and weakly nonlinear instability have been implemented on a cylindrical liquid sheet and the effect of spray cone angle was not included in the model. Therefore, in this paper in order to improve the model, the linear instability theory is implemented on a cone-shaped liquid sheet for the first time, and therefore radial velocities of liquid and gas phases are also considered moreover than axial and tangential velocities. The results of this improved model such as maximum wave growth rate and its corresponding wave number can be used to estimate mean droplet diameter and breakup length. L. Bayvel, z. Orzechovski, liquid atomization, Second Edittion, Taylor & Francis, 1993. S. P. Lin, Breakup of Liquid Sheets and Jets, First Edittion, Cambridge University Press, 2003. W.A. Sirignano, C. Mehring, Review of Theory of Distortion and Disintegration of Liquid Streams, Progress in Energy and Combustion Science, Vol. 26, No. 4,pp. 609-655, 2000. J.C. Lasheras, E. J. Hopfinger, Liquid jet instability and atomization in a coaxial gas stream, Annu. Rev. Fluid Mech., Vol. 3, No. 1, pp. 275–308, 2000. K.A. Sallam, Z. Dai and G.M. Faeth, liquid breakup at the surface of turbulent round liquid jets in still gases, International Journal of Multiphase Flow, Vol. 28, No. 3, pp. 427-449, 2002. F. Chen, J.-Y. Tsaur, F. Durst, S. K. Das, On the Axisymmetry of Annular Jet Instabilities, J. Fluid Mech., vol. 488, No. 1, pp. 355-367, 2003. M. V. Panchagnula, P. E. Sojka, P. J. Santangelo, On the Three-Dimensional Instability of a Swirling, Annular, Inviscid Liquid Sheet Subject to Unequal Gas Velocities, Physics of Fluids, Vol. 8, No. 12, pp. 3000-3312, 1996. W.A. Sirignano, C. Mehring, Comments on Energy Conservation in Liquid-Stream Disintegration, Proceedings of ICLASS, USA, Pasadena, California, 2000. AA. Ibrahim, Comprehensive study of internal flow field and linear and nonlinear instability of an annular liquid sheet emanating from an atomizer, Ph. D. thesis, University of Cincinnati, 2006. A.A. Ibrahim, M. A. Jog, S. M. Jeng, Computational Simulation of Two-Phase Flow in Simplex Atomizers, ILASS-AMERICAS, US, Irvine, California, 2005. J. Cao, Theoretical and Experimental Study of Atomization from an Annular Liquid Sheet, J. Automobile Engineering, Vol. 217, No. 8, pp. 735-734, 2003. X. Jeandel, C. Dumouchel, Influence of the Viscosity on the Linear Stability of an Annular Liquid Sheet, International Journal of Heat and Fluid Flow, Vol. 20, No. 5, pp. 499-506, 1999. Y. Liao, S. M. Jeng, M. A. Jog, M. A. Benjamin, Advanced Sub-Model for Airblast Atomizers, Journal of Propulsion and Power, Vol. 17, No. 2, pp. 411-417, 2001. Q. Du, X. Li, Effect of Gas Stream Swirls on the Instability of Viscous Annular Liquid Jets, Acta Mechanica, vol. 176, No. 1, pp. 61-81, 2005. Y. Liao, S. M. Jeng, M. A. Jog, M. A. Benjamin, Effect of Air Swirl Profile on the Instability of a Viscous Liquid Jet, J. Fluid Mech., Vol. 424, No. 1, pp. 1-20, 2000. Y. Liao, A. T. Sakman, S. M. Jeng, M. A. Jog, M. A. Benjamin, A comprehensive Model to Predict Simplex Atomizer Performance, J. of Engineering for Gas Turbines and Power, Vol. 121, No. 1, pp. 285-294, 1999. E. A. Ibrahim, T. R. McKinney, Injection Characteristics of Non-swirling and Swirling Annular Liquid Sheets, Proc. IMechE Part C: J. Mechanical Engineering Science, Vol. 220, No. 2, pp. 203-214, 2006. J.M. Gordillo, MP. Saborid, Aerodynamic effects in the break-up of liquid jets: on the first wind-induced break-up regime, Journal of Fluid Mechanics, Vol. 541, No.1, pp. 1–20, 2005.